Thank you for your patience during our transition to the SPARK library system. In order to log in to “My Account” on the above menu bar, you will need a new password. Stop by or call us for assistance. AS OF FRIDAY, APRIL 19TH OUR PHONE SYSTEM IS NOT FUNCTIONING. WE APOLOGIZE FOR THE INCONVENIENCE. Come one, come all! Sign up now to experience this interactive theatrical presentation of Colonial Life on Thursday, May 2nd at 6pm. Click on the Kit’s logo for more information. Call us at 570-646-0826 or stop in to reserve your seat now! Sponsored by Sullivan Trail Questers. Check out our new database. From Lynda.com: “Lynda.com is a leading online learning platform that helps anyone learn business, software, technology and creative skills to achieve personal and professional goals. Through individual, corporate, academic and government subscriptions, members have access to the Lynda.com video library of engaging, top-quality courses taught by recognized industry experts.” Subscription to Lynda.com has been paid for by a grant from the Todd and Shari Family Foundation. Want to gain invaluable professional skills? Join us in this event series to learn business style writing, including emails and résumés. You will receive individualized help to fit your needs. This event is free to attend. In this informal and fun meeting, members help make the library more teen-friendly. Snacks are provided. No sign-up needed. New members are always welcome. Grades 7-12. No more waiting for items! hoopla is a service that allows you to borrow movies, music, audiobooks, ebooks, comics, and TV shows to enjoy on your computer, tablet, phone, or TV. You can stream titles immediately through your desktop browser or our mobile app (on the app, you can also download titles to your mobile devices to enjoy offline). We have hundreds of thousands of titles to choose from, with more being added daily. Please call us if you have any questions or issues. Each month, we choose a Database of the Month that we offer online. This month’s database is CyberSmarts, which can found by clicking the “Power Library” menu item above. Look for CyberSmarts among the many helpful free databases offered by the PA Power Library. Friends of Clymer Again Accepts Donations! Book Sale & Plant Sale – April 25, 26, & 27! Donate your gently used books! 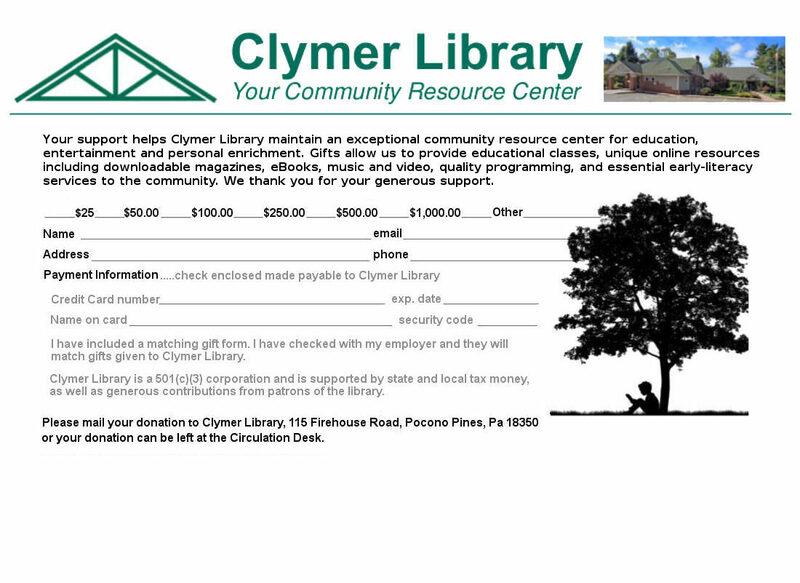 With renovations complete, Friends of Clymer Library will again accept donations of gently used, resalable books, CDs, games, and puzzles. Please note that we cannot accept magazines, textbooks, encyclopedias, or moldy and/or stained editions. Please bring your donations into the library, and you will be directed where to place them. Upcoming board meeting: April 17th at 6:00 PM. Board meetings are open to the public in the multi-purpose room. You are cordially invited to join us and your input is both encouraged and valued. Minutes of the meetings are available at the circulation desk in the library. Wanted: Teen & Adult Volunteers! Teens, colleges want to see volunteer hours! Shifts are 2-3 hours each. Staff will train you. If you can work any time from 10-5 on Mondays, Wednesday, Fridays, and Saturdays, and from 10-8 on Tuesdays and Thursdays, then call the library and ask for Diane, or stop in at the circulation desk and ask for an application. Congratulations to Cindy Gagliardi, our March Volunteer of the Month! providing access to quality, innovative resources.